This paper presents four extensions to the Interprocedural Finite Distributive Subset (IFDS) algorithm that make it applicable to a wider class of analysis problems. IFDS is a dynamic programming algorithm that implements context-sensitive flow-sensitive interprocedural dataflow analysis. The first extension constructs the nodes of the supergraph on demand as the analysis requires them, eliminating the need to build a full supergraph before the analysis. The second extension provides the procedure-return flow function with additional information about the program state before the procedure was called. The third extension improves the precision with which φ instructions are modelled when analyzing a program in SSA form. The fourth extension speeds up the algorithm on domains in which some of the dataflow facts subsume each other. These extensions are often necessary when applying the IFDS algorithm to non-separable (i.e. non-bit-vector) problems. We have found them necessary for alias set analysis and multi-object typestate analysis. 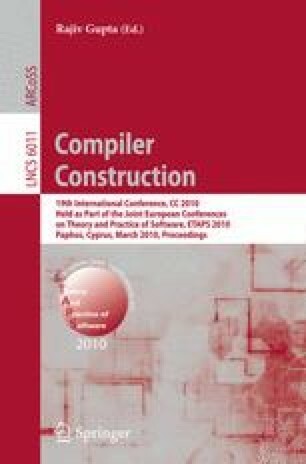 In this paper, we illustrate and evaluate the extensions on a simpler problem, a variation of variable type analysis.